Italian shipbuilder Fincantieri (one of the world's largest builders of cruise ships) signed the paperwork today to acquire another large builder of ships, STX Europe in Saint-Nazaire, France, formerly Chantiers D'Alantique. The company agreed to purchase 66.66% of the STX Europe stock for 79.5 million euros, which will be paid in cash. Apparently the Mexican Riviera is coming back for cruisers on the West Coast. Holland America's Oosterdam will be joining Westerdam on the popular itinerary, with both Vista-class ships based at San Diego for the 2017-2018 season. One of the main features of MSC's Meraviglia-class is the ultra high-tech $22 million Carousel Lounge, which is designed specifically for its starring entertainers, Cirque du Soleil. The famous acrobatic troupe is designing eight entirely new shows for the four Meraviglia ships in the series. With the first ship in the series, MSC Meraviglia, set to enter service on June 4, MSC has release details of the first two Cirque du Soleil shows. Earlier this week (Monday morning), Island Princess experienced a small engine room fire while the ship was doing scenic cruising in Glacier Bay. Princess said the cause of the fire was a lubrication leak that allowed lubrication oil to drip onto a hot exhaust pipe. How many people know exactly what they will be doing on a given day in the first quarter of 2019? Or even in December 2018? If you were one of the first to book Holland America's Nieuw Statendam today, you know what you'll be doing. The line opened the books today for the inaugural season for their second Pinnacle-class ship, and announced that the ship will be homeported at Port Everglades for the 2018-2019 winter season, so its inaugural voyage will be a 14-day transatlantic crossing from Rome to Ft. Lauderdale. 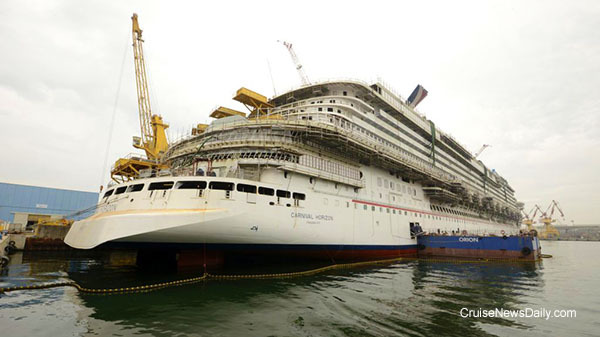 The complete story appeared in the May 17 edition of Cruise News Daily. Carnival Cruise Line has scheduled Carnival Elation to sail a special eight-night cruise next spring from Jacksonville to Bermuda and the Bahamas. Details appeared in the May 17 edition of Cruise News Daily. A couple months ago we told you about all the additional features being added to Cunard's Queen Victoria during its month-long dry dock. The ship is now about half way through it, and Cunard has provided us with some cool video of the extra space being created on the ship. Queen Victoria arrived at Fincantieri in Palermo on May 5, and work began immediately. Last week the new aft sun deck and three decks below it (creating three new decks of interior space) were lifted onto the ship. A short video of the operation is below. 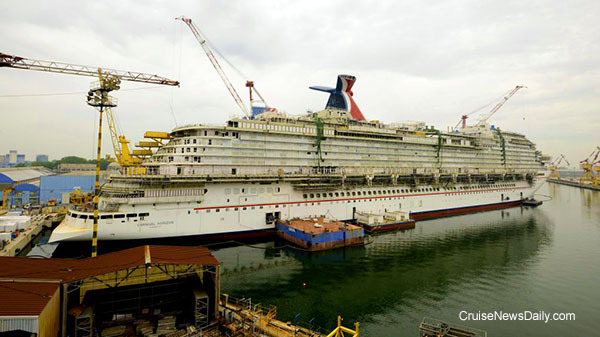 Carnival Horizon is set to enter service less than a year from now (April 2). The line released some current yard photos, and it looks like there is a massive amount of work yet to do (there is), but it will go quickly. 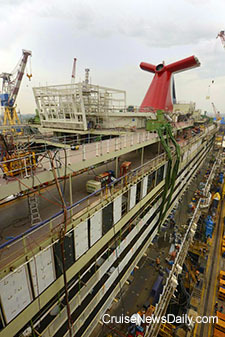 Photos courtesy o Carnival Cruise Line. All rights reserved. May not be copied or used without express permission. The 2016 figures are in, and the demand in Australia for cruises is officially exploding. Last year, passengers increased by 21%. That means an additional 222,378 Australians cruised last year for a total of 1,281,158 cruised in 2016. Carnival is having a big sales rally for agents in New Orleans (Agent Palooza). The company has even adopted the motto “Travel Agents Rock.” They are committed to travel agents. Leading that commitment is Carnival's VP of Trade Sales & Marketing, Adolfo Perez. 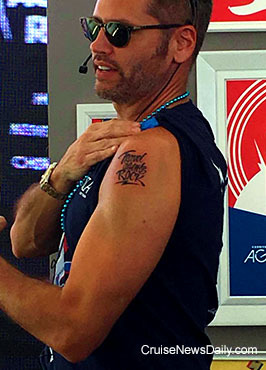 So much so that over the weekend at the Agent Palooza had “Travel Agents Rock” tattooed to his arm. Yes, it's real. It's not a temporary tattoo. If you want proof, you can see him get it in front a group of cheering agents, in a video that was originally broadcast live. 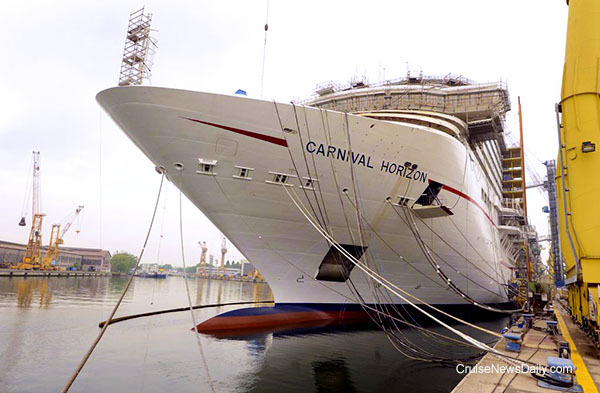 We can't imagine what other lines' VP's will to show they are more committed than Carnival. This story appeared in the May 15 edition of Cruise News Daily.